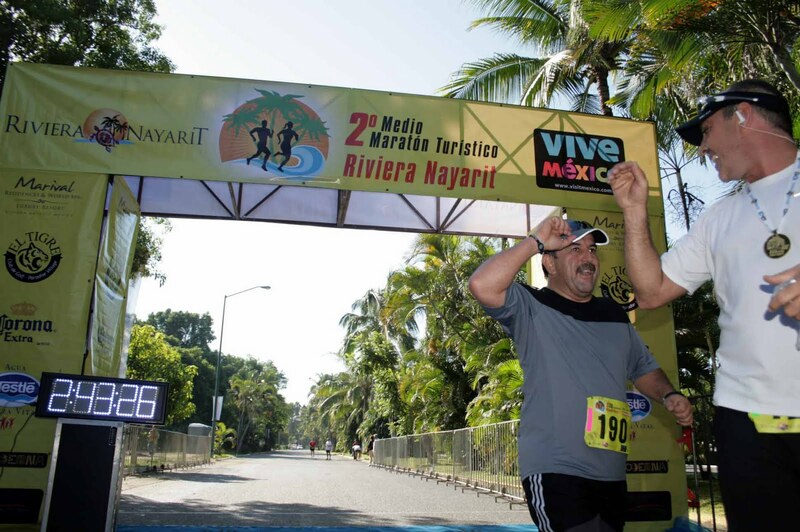 Ema Leticia Joya from Jalisco and Juan Carlos Razo from Nayarit were the winners in the respective male and female categories at the 2nd Touristic Half Marathon of Riviera Nayarit, which represents yet another success story for this touristic destination after assembling 310 runners from all over Mexico. Juan Carlos Razo took 1 hour, 15 minutes and 44 seconds to run the 21 km course that was deemed by officials from the Association of International Marathons and Distance Races (AIMS) as one of the most beautiful in the world. Upon crossing the finish line, the Nayarit native raised his arms to celebrate his victory in the overall male category. Fourteen minutes later, with a time of 1 hour, 29 minutes and 15 seconds, Ema Leticia Joya crossed the finish line, taking the first place in the female category and the eight place in the general category. The awards ceremony was a social event organized at the Marival Resort & Suites, one of the hosting hotels for this event, which offered a brunch for participants. "This is the first time I participate in such a large event, and God willing I'll be able to take part in future events, as it was a marvelous experience. I'd like to congratulate you for the successful organization of this event, and I'll see you next year", stated in an email Ricardo Ibarra Bosques, who won the second place in a simultaneous 10 km race in the Male Category E, for adults between the age of 60 and 64. Riviera Nayarit stands out because of its beauty, its natural settings, the warmth of its people and the touristic services they offer, and its high-quality hotel infrastructure. Because of these reasons, it was easy for the organizers to settle on this destination, as it'll be a key factor to the success of this event. Since the creation of the Riviera Nayarit brand three years ago, a priority for the industry has been to attract high quality tourism that poses a low environmental impact. This isn't only a marketing issue, but a strategy led by Governor Ney Gonzalez Sanchez to achieve an integral development of the community and to increase not only the raw economic indexes, but also the well being of the society as a whole - and high performance sports are a key niche to achieve this goal. Dear Tim, we are contacting the organizers, will be back to you in a few days.